An event like this can really damage your system if you aren’t careful. The meals alone that businesspeople usually consume while attending an event like this are cause for health concern. It’s “continental breakfast” in the hotel each morning, trade show food at lunch (expensive convenience-store sandwiches, burgers, hot dogs), snacks of candy and junk food at the booths, and huge dinners every night with clients. And then on top of that people often overindulge in alcohol after dinner. You can spot those folks pretty easily the next day on the trade show floor. Brett and I are old hands at this routine and we both know you’ve got to pace yourself. Sure, it’s a “free” breakfast and maybe someone else is paying for dinner on his expense account, but if you eat it all you’ll be a constipated and slow-moving target in a few days. We tried to eat light, avoid fatty foods, avoid alcohol, avoid excessive caffeine, stay hydrated, and then run like hell for two days around the trade show floor. We wanted to show everyone we met that we were energetic, upbeat, and ready to do business, and it worked. I think the reason that people so often crash and complain at big events like this is that they set themselves up for it, simply as a result of underestimating the stress they’ll face. You’ve got potential jet-lag, bad food, irregular meals, uncomfortable shoes, long hours at the booth, sleep deprivation, tedious meetings, and sometimes an emotional rollercoaster with every potential new client. It’s a formula for physical collapse after a few days in the best of times if you don’t know how to manage it. This year was particularly hard on some folks because they have been under financial stress as well. Anyone who sells into the manufacturing market (OEMs), or is a manufacturer, is feeling the pressure. For a lot of them, filling up their order book at RVIA was mandatory for survival, and I think there will be more than a few who fail in the months to come as a result of not hitting their goals. 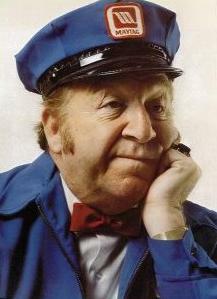 We certainly noticed a few who looked like the Maytag repairman during what should have been busy times on the trade show floor. Fortunately, we received an excellent reception. We targeted the makers and sellers of interesting premium products that Airstreamers would like, and found that universally those folks were doing fine in the current economy. We’d pitch them by pointing out that our audience likes innovation, good design, and high quality, and they’d usually respond by saying they needed to target such people. Then we’d show them how we could save them money by redirecting their big ad spend from XXXX publication to Airstream Life, and — voila– we’d have a solid new prospect. Everyone has been asking me for “news from the show.” Honestly, I didn’t spend much time gathering gossip or reading the press releases, and we didn’t go to any seminars or talks. What I saw was much the same as prior years, except that a few manufacturers were showing “eco-friendly” designs (meaning some changes in materials), and there were some super-lightweight experiments as well. Damon has a new Class A motorhome that they claim gets “up to” 14.5 MPG, and Dutchman introduced a 30-foot bunkhouse that weighs about 3,000 lbs. In both cases, my sense was that they’re going to have to figure ways to engineer out the generally flimsy feeling of the interior appointments, but I’m glad to see them at least starting in the right direction. Airstream had one lightweight prototype to show, a “skunk works” experiment called the “Scout.” It’s a retro canned-ham style trailer that incorporates a lot of new materials for a base weight of about 2,000 lbs. It’s pretty neat but there’s no decision yet whether it will ever be produced — and if it is produced, it may not be badged as an Airstream. Still, the lightweight materials in this experiment may show up in new Airstream production soon. 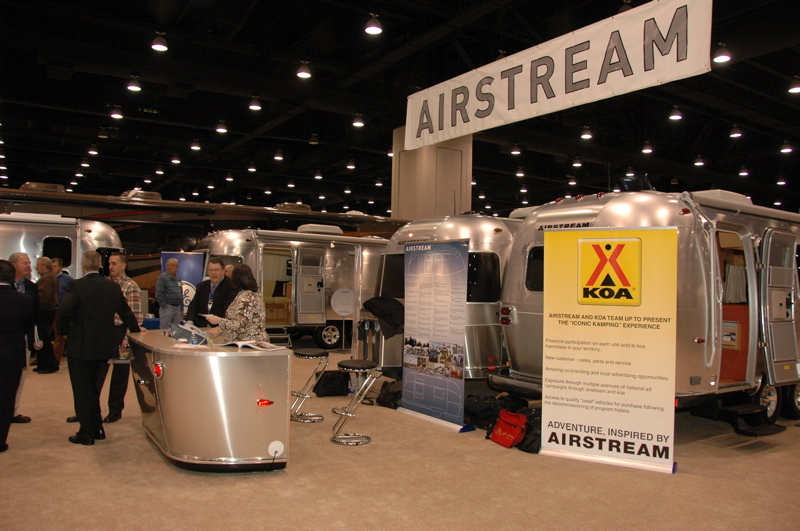 Airstream has also announced the shipment of a batch of trailers to KOA Kampgrounds across the country. These Airstreams will be available for rent in Las Vegas, Sugarloaf Key FL, Bar Harbor ME, and a few other locations. They’re calling this an “iconic Kamping experience.” Whatever you call it, I think it will be very popular. I get queries all the time from people wanting to know where they can rent an Airstream, but up till now it was impossible. 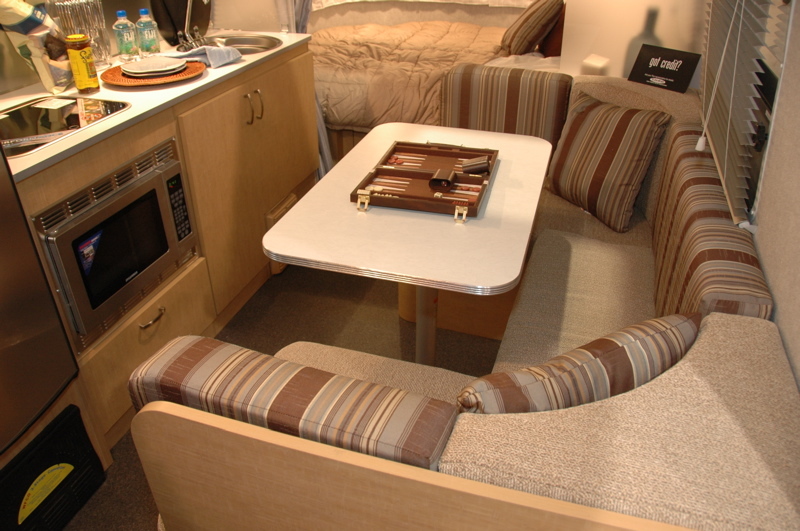 Although you can’t tow these Airstreams away from the KOA, you can spend a night in one and discover how cool they are. It’s a great way to try before you buy! 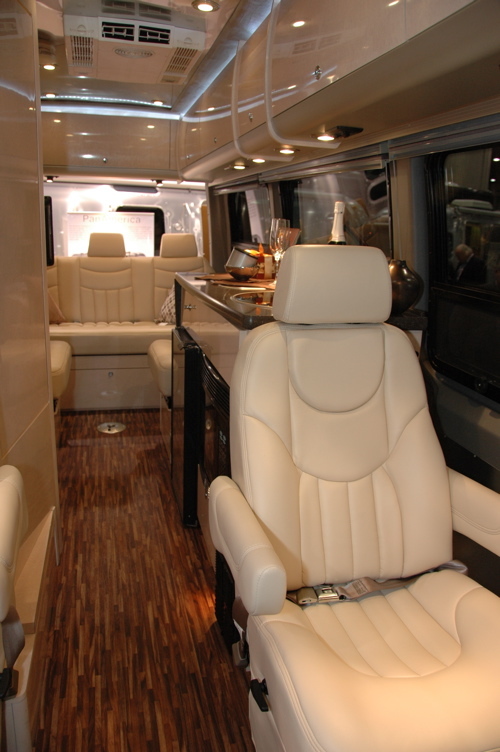 We also got tours of some of the newer Airstream models. John Huttle walked us through the Airstream Interstate 3500 again (we saw it previously in Jackson Center last summer). Now they’ve got a $3,000 upgrade package that gives you a beautiful floor, Mercedes-Benz seating throughout, slick cabinetry, more LED lights, and other tweaks. One passer-by jokingly called it the “Pimpstream.” With this package, the interior looks like a business jet. I could not believe how comfortable the seats were. If I had $120k to spend, I would buy this rig, hit the road at 22 MPG, and never come back. It’s a good thing for my family that I can’t quite afford it. Later, Bruce Bannister took us into the latest iteration of the Sport series, which is Airstream’s lowest cost and lightest trailer line. The new Sport 22-footer is really smart, with a new wrap-around dinette and front bedroom, plus the same roomy rear bath that previous Sports had. 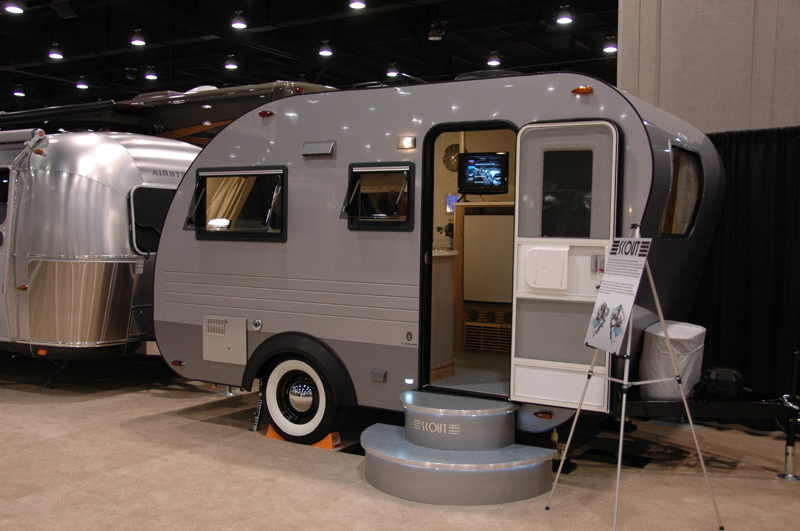 For the money (probably low $30s) and the lower weight, it will make sense for a lot of new Airstream buyers. All the Airstream guys were wearing round buttons that said, “got credit?” Parent company Thor has reopened its consumer credit division, so lending to potential buyers is not a problem if you buy Airstream (or another Thor brand). This was not news at RVIA, but it certainly did cause a buzz in the crowd. Anytime someone complained that sales were slow because of credit problems, someone else would mention the Thor move, and the discussion would come to an abrupt halt. My feeling overall is very bullish. Not only are we still seeing plenty of advertising prospects, but everyone in the service or aftermarket parts sectors claims to be doing just fine. People are still using their RVs, upgrading them, and lately enjoying low fuel prices. Marginal manufacturers with bad products, heavy debt, or inflexible business models are suffering the most, and some of them will go away soon. I think we need to work out some redundancy in the market, clean up some overextended businesses, and continue to work on the credit problem, and then we’ll see a general rise in 2009. So now I’m back in Tucson, a bit tired but ready to tackle the tasks of the coming weeks. There are many follow-up calls to be made, plus the Spring 2009 issue is in production, and a lot of activity in our store, too. Time to get in gear, and work toward a great 2009! Good news from the front line. the scout concept trailer looks really cool. Marlene and I got Carrie thinking about living life on the road and it might just be the right trailer for her. I am intrigued at how KOA will handle the Airstreams. I am guessing they will just be an alternative to a cabin rental which is a really good way for people to get interested in maybe buying one themselves. As always, good to see you and Brett at the show. Glad you survived.